ELMIRA – The Hanson Family Singers are yodeling their way to Hollywood. The family may be featured in a new film that takes the classic children’s novel “Heidi,” and gives it a twist. “Heidi 4 Paws,” recreates the story using a cast of all dogs. “I took my two obsessions, one with dogs, the other with Heidi, and put them together,” said Holly Goldberg-Sloan, director of the film. Goldberg-Sloan, who also wrote Disney’s “Angels in the Outfield” and directed “The Big Green,” grew up in the Willamette Valley and graduated from South Eugene High School in 1976. To keep in touch with her Eugene roots, she often reads the online version of The Register-Guard several times a week. It was there that she discovered the Hanson Family Singers and their yodeling talents. “I noticed this really cute picture of a kid in a cowboy hat,” she said, referring to the newspaper’s Web site, which included an audio link. After she heard 12-year-old Daniel Hanson yodel, she contacted the family. Daniel, the youngest of seven children in the Hanson family, won the international yodeling championship last November in Albuquerque, N.M.
“They contacted us to see if they could use some of our yodels,” said Wayne Hanson, the patriarch of the family singing group. To give Goldberg-Sloan a real taste of what the Hanson Family Singers had to offer, he had Daniel and his sister, Theresa, 14, sing a two-part harmonized yodel. The Hansons have traditionally done western yodeling, but they were willing to modify their style to fit the Swiss style of Heidi. “We’ve done some Swiss yodeling before,” Daniel said. The family went to a local studio and recorded 15 yodels, even though Goldberg-Sloan only asked for two. Daniel, Theresa and Lisa, 16, sang three-part harmonizing yodels. Daniel and Theresa recorded singular yodels. And even their father joined in for an echoing yodel to be used in the background. Hanson videotaped the recording process for special featured for the film. After the family sent the recording to Goldberg-Sloan, the studio had to match the mouths of the dogs with the yodeling sounds by using computer animated mouths. Goldberg-Sloan said the animation process is similar to the process used in classical animation. They shoot the dogs in live action and high definition, record the voices, then animate the mouths of the dogs to match the video and audio recordings. After working on “Heidi 4 Paws” for over two years, Goldberg-Sloan said she is two months away from finishing the movie. She plans to pitch the film to studios like MGM, Paramount and Disney. She is unsure, however, if it will be produced for television or theatre release before going to DVD. She hopes it will be the first in a series of eight movies adapted for man’s best friend. Robin Hood is next on her list. “I’ve been working on the movie for two years,” said Goldberg-Sloan. “It’s bigger than anything we’ve done before,” Lisa said of the local family’s singing efforts. Backstage snap snots from the production of Heidi Four Paws. Ocean Park pictures along with Television Productions classes TAT-60 and TAT62 are filming the movie Heidi Four Paws in the VSS production studio. 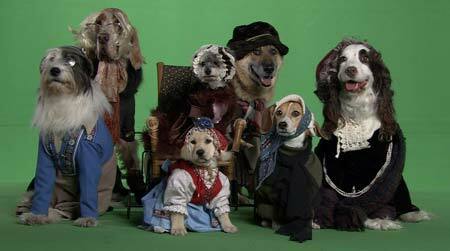 Heidi Four Paws is a child’s movie using dogs as actors about the classical story of Heidi. The movie will have the animals talking, aided by a green screen effect. Ocean Park Pictures is using the production space in the VSS building and students for production assistance. While the production is filming, students help with the animals, costumes and anything that meets the needs of the film and crew. “Production on campus gives students experience in what production on a movie is like and what the environment is all about,” said Daniel Holechek, production studio technician for Chaffey. The animals being used are from Jungle Exotics of San Bernardino and Bow-Wow Productions of Hesperia. There were between 10 and 20 dogs used in the filming on campus. The director on this film is Holly Goldberg-Sloan who helped write the movies Angels in the Outfield and Crocodile Hunter. She also wrote and directed Big Green and Secret Life of Girls. Chaffey was chosen because of the close proximity to the dog handler, Joe Camp of Jungle Exotics in San Bernardino. He is famous for training the dog for the movie Benji, the cat in Austin Powers and many others. “Since the whole cast is all dogs, we wanted be close to them,” Goldberg-Sloan said. “We went up and saw the dogs (at Jungle Exotics) and even thought about shooting up there but Mr. Camp didn’t have the space,” said Tim Goldberg Executive Producer/Owner of Ocean Park Pictures. For production Chaffey had an amazing facility for filming green screen, according to Goldberg. According to Sloan, the students of Chaffey are also wonderful to work with. “We actually shot one day in May here and we loved the location and students, so we came back,” Sloan said. Lizette Mendez, a film major who worked as a production assistant on the film, started her day at 6 a.m. She didn’t finish until 5 p.m.
“It is hard work and I am tired, but I don’t mind it. It is what I want to do,” she said. MGM Studios paid for the test of this movie. Since then MGM was bought out by Sony so who will pay for the film is unclear, according to Goldberg. MGM will , however, distribute the film. How can I view Heidi 4 Paws online or when will it be shown again in the Orlando, Florida (34711 zip) area?